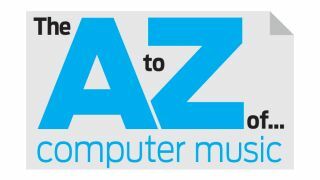 Learn more computer music lingo as we explain principles, techniques and tools of the trade, this time focusing on the letter D.
The 'opposite' of a DAC is an ADC, which converts analogue signals to digital. Digital Audio Workstation. This is a digital system for recording, playing back and editing audio. That system could be a dedicated piece of hardware (such as the hard disk recorder/mixer combos that were popular in the '90s) or - much more likely these days - a computer-based setup. For a computer to be used like this, it needs some DAW software, and today's DAW applications go far beyond basic recording and editing, with features like effects, plugin support, virtual instruments and MIDI capability. Popular DAW packages (eg, Logic, Sonar, Cubase, Ableton Live, etc) offer practically everything you need to make a complete piece of music in any style. Note that the term DAW has a dual meaning: some producers consider it be your whole computer music setup (computer, audio interface, software, etc) while for others the software is the DAW. We stick to the (now prevalent) latter definition. The tail end of any sound as it dies away to silence. Decay is also the 'D' in ADSR - a type of envelope found in synths and other musical devices. For instance, if a signal peaks at -12dB, its loudest peaks are 12dB below 0dBFS - increasing its level by, say, 15dB would cause it to exceed 0dBFS by 3dB, clipping the peaks of the waveform upon playback. In filters, the dB/octave rating indicates how 'steeply' the frequencies in a signal are reduced beyond the cutoff point. So, with a 12dB/octave filter, each octave beyond the cutoff point is reduced in level by a further 12dB. Filters are sometimes instead specified as having a number of 'poles', where 6dB equates to a 'pole', so a 24dB/octave filter is known as a 4-pole filter. When audio is encoded to MP3, OGG, FLAC or any other compressed format, it must be decoded back to normal uncompressed digital audio for playback. The term is also used in reference to mid/side processing, where a stereo signal is converted (encoded) into mid (mono) and side (stereo) signals for processing each individually, before being decoded back to stereo for playback. An effect used to reduce sibilant vocal sounds (such as 's' and 'f'.) Some de-essers reduce the entire signal's level when sibilant frequencies are present; others use EQ or multiband processing to cut only the sibilant range. This effect delays the input signal then plays it back after a user-specified interval - an echo, in other words - with an optional feedback loop enabling the output to be fed back into the input for repeating delays that get quieter (decay) over time. Common features are ping-pong mode, causing echoes to 'bounce' between the left and right speakers; filtering in the feedback loop, so echoes become progressively darker, brighter, etc; host sync, for echoes that are locked to the rhythm of your song; and multitap operation, which lets you run multiple delays of varying timings at once. Some delays mimic old-school hardware tape delays, where changing the delay time adjusted the speed of a loop of tape, causing the pitch to change. Delay can also refer to the latency in a digital recording/playback system. Check out The ultimate guide to effects: delay for more. Direct Input or Direct Injection, this refers to plugging a guitar or other instrument directly into an audio interface, rather than running it through an amplifier first. A clean, DI'ed guitar signal, for instance, is used as the input for virtual guitar amplifier effects. Audio can be 1) A soundwave that travels through the air 2) An electrical signal that passes through wires and electronics 3) A digital audio signal in your computer. The first two of these are analogue - the signal can be thought of as a continuous curve/line with effectively infinite resolution - you can always zoom in further to see the waveform in greater detail. If analogue audio is a smooth curve on graph paper, digital audio is a series of points dotted on that curve at regular intervals at the nearest grid division. There's a misconception that this means digital audio must be stepped/jagged, but a DAC's reconstruction circuitry ensures that, when converted back to an analogue signal, the audio has a perfectly smooth curve. AKA 'polar pattern'. The angles from which a microphone is able to pick up sounds define its directional pattern. See also: Cardioid. In music production, we usually mean harmonic distortion, which introduces harmonics musically related to the source frequencies. Distortion is also the name of a common effect that applies strong harmonic distortion, often inspired by guitar pedals. Saturation and overdrive are other sources of harmonic distortion, though they are generally less overt than effects specifically labelled 'distortion'. In addition, bitcrushing and sample rate reduction, while not giving harmonic distortion, are largely thought of in the same category, as tools for dirtying-up signals in a useful way. Check out The ultimate guide to effects: distortion for more. Random noise added to a signal in order to "disguise" ugly quantisation noise caused by a reduction in bit depth - for example, when converting a 24-bit audio file to a 16-bit one. More accurately, it's essentially the conversion of one form of digital noise into another that's more pleasant to listen to. Dither is often an option in the export settings of your DAW. In computing, a driver is a software layer that sits between the operating system/applications and a piece of connected hardware, such as an audio interface or MIDI keyboard, enabling the two to communicate. With audio interfaces, a chief concerns is reducing latency, and to that end, a 'serious' driver such as ASIO (Windows) or CoreAudio (OS X) is best. Most modern audio interfaces of any quality support both. In loudspeakers, the driver is the speaker cone and the electrical mechanism causing it to move, thus creating soundwaves. A device that mimics the sounds of the drum kit and other percussion instruments, using either synthesis or sample playback, usually including sequencing for creating rhythms with them. There are many plugins that emulate classic drum machines such as Roland's TR series. In effects, the dry signal is the effect-free input signal; the wet is the signal with the effect applied. In some effects (eg, reverb) the 'dry' signal is mixed with the 'wet' one to achieve the desired amount of the added effect, and there's usually a dry/wet control for the user to set this. Dry also describes a sound with little or no reverb/ambience, ie, sounding as if it was recorded in a 'dead' room. The manipulation of a digital data signal - including audio - is known as Digital Signal Processing. Effects plugins, mixer EQs and timestretch algorithms are all examples of DSP. DSP also refers to dedicated Digital Signal Processor hardware, such as Universal Audio's UAD-2 series. With UAD-2 DSP hardware connected to the computer, UAD-2 plugins are loaded as normal in your DAW, but the actual processing takes place inside the DSP hardware, thus reducing the load on the computer's CPU. The process of one signal being reduced in volume by the presence of another, either by a fixed amount or dynamically, where the signal is ducked more when the control signal gets louder. Ducking can serve all manner of purposes, from making a bassline or synth pad pulse in time with a kick drum to lowering the volume of a music track in a radio broadcast when the DJ talks. It's usually done using sidechain compression: in the radio example, the DJ's voice feeds into the sidechain input of a compressor (as well as its mixer input,) while the music feeds into the same compressor's main input. When the voice hits the sidechain, the compressor responds to it by dropping the volume of the music track. The most affordable type of microphone, dynamic mics work like a loudspeaker in reverse, converting movement of a diaphragm by sound waves into a high-gain signal that doesn't require pre-amplification before being connected to a recording device or processor. The changing volume of a sound over time, and how loud or quiet it is in relation to other sounds and itself. Dynamics processors - including compressors, gates and transient-shaping effects - manipulate these aspects.